Portland is a beautiful city, but space can be limited. Businesses and property owners may have limited yardage, but that doesn’t mean they can’t have a fantastic place to entertain. An excellent Patio roof in Beaverton is the perfect solution, and Pioneer Roofers has been providing Beaverton property owners with beautiful, durable, functional patio roofs for over 20 years. 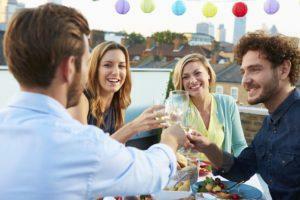 Entertain Company – One of the very best reasons to get patio roofs in Beaverton is for the entertainment. If you have a view this can be a fantastic way to enjoy it with friends and family. It also provides apartment residents with a wonderful place to congregate and enjoy the weather. Our patio roofs are custom built, and we can create areas for different functional uses. This includes lush garden areas that can attract local wildlife, save energy, and much more. Reduce Costs – Patio roofs actually have a significantly lower maintenance cost than pitched roofs do. This is because maintenance is much easier to perform. It doesn’t require special safety equipment, and you can even perform basic maintenance yourself. Clearing off debris is as easy as a walk around the rooftop. When we perform your more advanced maintenance procedures every few years, your patio roof in Beaverton will last for years to come. Increase Durability – Modern materials can create patio roofs in Beaverton that last as long as 50 years. We’ll discuss materials with you beforehand to determine the right choice for your needs. Durability isn’t just based on materials though. With an incredibly low wind resistance, flat roofs are much better equipped to deal with the frequent winter wind storms that pummel the Northwest. They’re very easy to inspect, making it much simpler to identify any problems you may have. With more than 20 years of industry experience, we’ve been providing Beaverton with patio roofs for decades. That’s because residents and builders alike know that our quality is unmatched. We work closely with our clients to determine their needs, getting input on important factors like layout, material choices, and potential future plans. This helps us to create patio roofs without surprises, that get you everything you’re looking for from functional design to enhanced safety features. We provide exceptional craftsmanship and only use the highest grade materials. Patio roofs in Beaverton provide some amazing benefits, but the construction needs to match. Since they’ll be supporting weight, structural integrity is integral. A patio roof needs to be built to hold up. Our experienced roofers ensure your roof can meet specified weight needs. We’ll discuss this with you prior to building, taking into account desires for furniture or related items. Water can also be a concern with patio roofs, but our experience makes this a non-issue. We design all of our patio roofs to repel water and make sure the correct gradiation is achieved for appropriate run off. This helps to channel water away from the roof and into downspouts, protecting your roof as well as your foundation. When you want patio roofs in Beaverton built to meet your needs and exceeds your expectations, call (503) 281-0305 or Contact Us today.